At the time, I didn’t know that my father and Dr. Ridha had gone to the same medical school in Baghdad. I didn’t know that they’d found each other at an American Academy of Neurology meeting in San Diego and that Dr. Ridha had invited us to his home for dinner. I didn’t know that the Ridhas were also Iraqi and Shia, because those were descriptors I still didn’t know to apply to myself. All I knew that day was that the Ridhas were different in the same way we were different. They spoke Arabic with “ch” sounds, replacing the “k” sounds; they ate rice with stews called marga; and they kept their five daily prayers, even though Mrs. Ridha, like Mama, did not cover her hair with the hijab. These were my signs that of the two types of boys in the world—those who were possible to marry and those who were impossible—the Ridha boys belonged to the former, the small population of boys from which I’d be allowed to choose a husband. It was a remarkable discovery for the early 1980s. The only Arab community in our small, seaside Northern California town was a secular social group filled with a mix of Lebanese, Palestinians, Syrians, and a few Iraqis who had immigrated so long ago they spoke more English than Arabic. No one in my parents’ small band of friends was quite like the Ridhas, whose dialect was still so fresh on their tongues , who knew so many other Iraqi immigrant families in the United States, and who matched our family not only in religion and level of devotion but also in ages and interests. The fathers got along. The mothers got along. The Ridha boys played well with my brother, Ibrahim, and Lina and I played well with their daughter, Jamila. In spite of the four-hundred-mile distance between our Northern and Southern California homes, our families clung to each other. When the Ridhas came to our house, we took day trips to Carmel Beach, Big Sur, and San Francisco . We came back dirty and tired, and waited in line for a turn in one of the two bathrooms in our small ranch home. When my family stayed with the Ridhas, they drove us to Los Angeles County, to their newly founded Islamic center or masjid, and to events with the other Iraqi families gradually moving into the area. Lina had been gripped by wedding fever ever since she’d fallen asleep and missed her chance to be a flower girl in Jamila’s aunt’s wedding. Jamila had promised Lina she could have a pretend wedding just as soon as everyone was done eating. At home, we’d baked Lina a box cake while she put on her favorite summer dress, the one with the ruffles and the hula-dancer print, and then she stuck a comb with a short tulle veil in her mess of curly blond hair. I listened to her voice bellow and admired the ease with which she commanded our brothers. Jamila was thirteen years old, four years older than me, and I believed in her authority . The boys, however, were unimpressed. The three of them continued slapping down the rocks they’d chosen, for their creek dam , with a clank and a splash. My older brother, Ibrahim, waded out of the water, looking peeved. He hated it when Jamila tried to organize us. The Ridha brothers stepped into their sandals, which were left at the side of a nearby rock, without a word and moved in behind Ibrahim. The sun had deepened the tone of the brothers’ already dark skin. Amjad, the younger and shorter of the two, was wiry, pure flesh and bones, while Hadi was stockier with a small tummy and a waist that gave in on both sides to a slight crease. Lina dropped her chin so low it almost touched her chest, and pushed her lips into a frown. “But a bride has to have a husband,” she said with such certainty it was clear that Lina already understood there were rules to getting married. Hadi stood there with water dripping from his hair and listened to his sister’s argument with his hands on his hips. He looked down and kicked the rock closest to his foot. He watched it scuttle across the ground. Surely Hadi knew there would be teasing—that our parents would laugh heartily at the memory of the little bride and her new husband for years to come—and yet he was willing to put up with this for my sister’s happiness. When Ibrahim opened his facetious wedding ceremony with, “Dearly beloved with the exception of Jamila,” my gaze fell on Hadi standing at Lina’s side, playing along with a sincerity I’d never seen in a boy. I took a snapshot of Hadi in my mind—still in his swim trunks and as tanned as a piece of overdone toast. I decided if I did, indeed, marry Hadi one day, this would be the moment I’d say I first fell in love with him. Huda Al-Marashi’s memoir First Comes Marriage is available here. 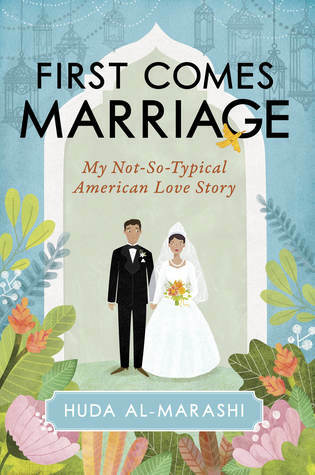 Huda Al-Marashi is the author of the memoir First Comes Marriage: My Not-So-Typical American Love Story. Her other writing has appeared in the Washington Post, the LA Times, al Jazeera, VIDA Review, Refinery 9, the Rumpus, the Offing and elsewhere. right now, but to push traffic towards other internet resources.